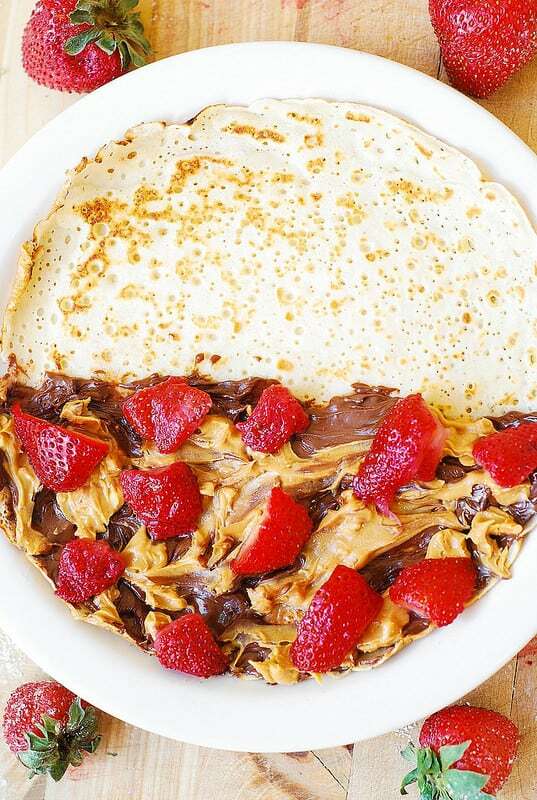 Peanut butter and Nutella stuffed crepes, topped with fresh strawberries in syrup. 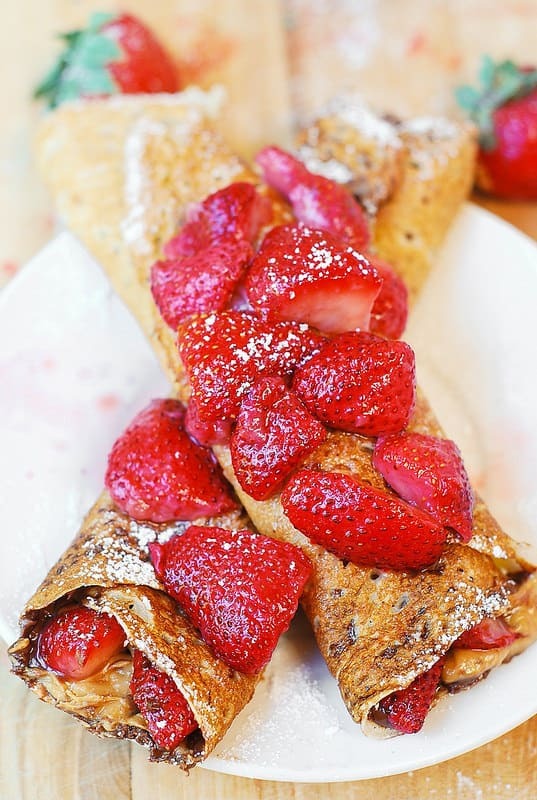 Delicious crepe filling recipe for homemade regular crepes or homemade gluten free crepes. 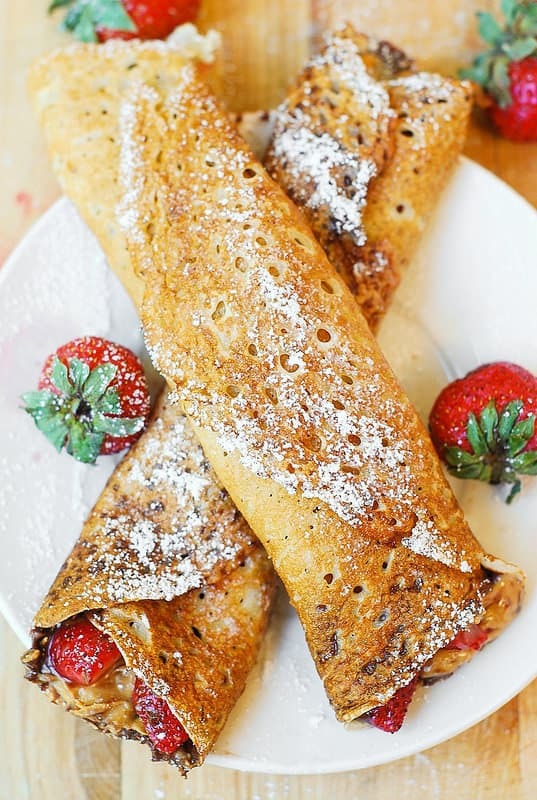 So good and easy to make, as long as you have a stack of pre-made crepes (I have a very good tutorial on my site – follow the link in the recipe instructions below). Make crepes according to this recipe. Or, if you're gluten free make gluten free crepes according to this recipe. Hull, clean, and slice the strawberries. Place them in a medium bowl, add sugar, mix and let them sit for about 30 minutes. The sugar will draw out water out of the strawberries, making them softer and sweeter. Place a crepe on a plate. 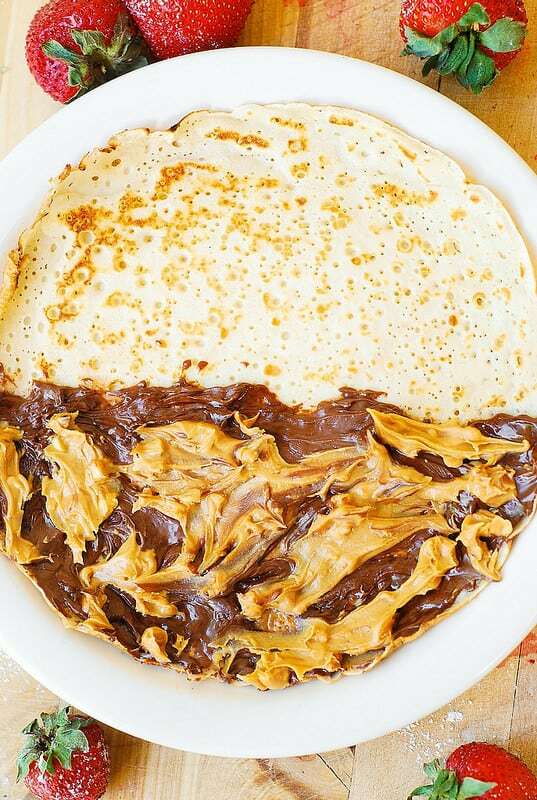 Spread Nutella thinly over one half of the crepe, then add swirls of peanut butter here and there. 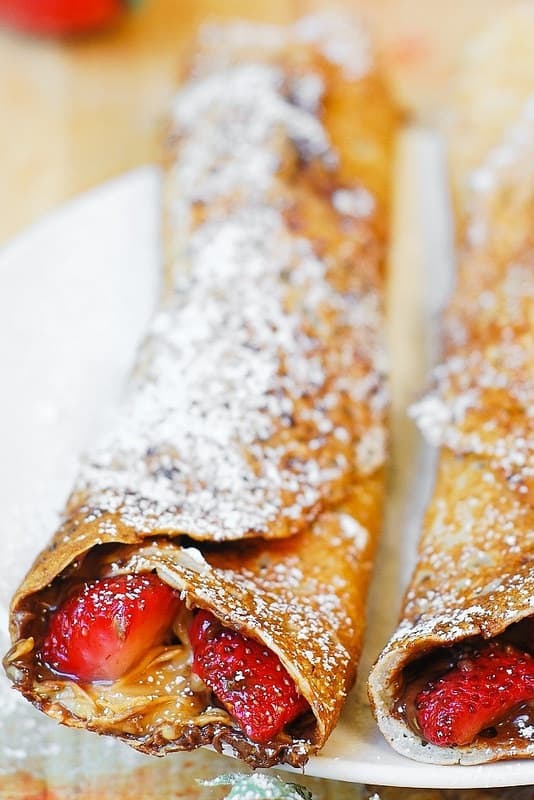 Place just a few strawberries on top of Nutella and peanut butter, then fold the crepe into a tube shape by rolling it from one side towards the other. Top with more strawberries and syrup. 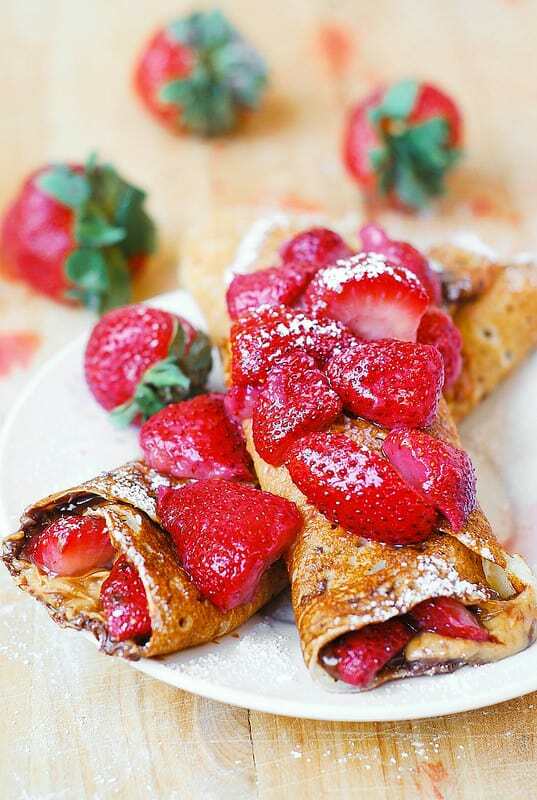 Alternatively, you don't have to top these stuffed crepes with strawberries, instead just sprinkle them with powdered sugar. You are the Crepe Master! These look so fabulous and perfect for a light summer dessert! I think if my son saw this post he’d want you to be his mother every morning! Who am I kidding? We could easily have these for dessert too! These look amazing! 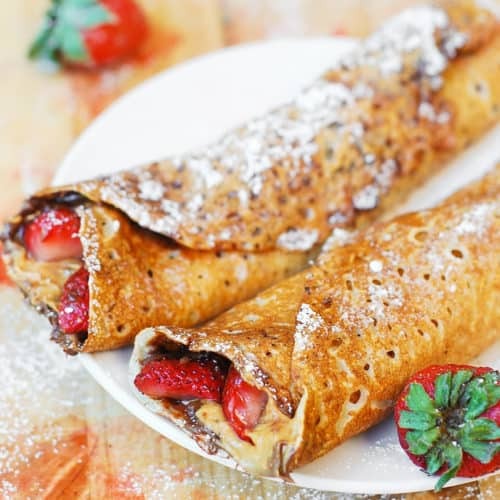 my 7 year old is obsessed with crepes so I definitely need to make these for him! Oh man I am drooling! 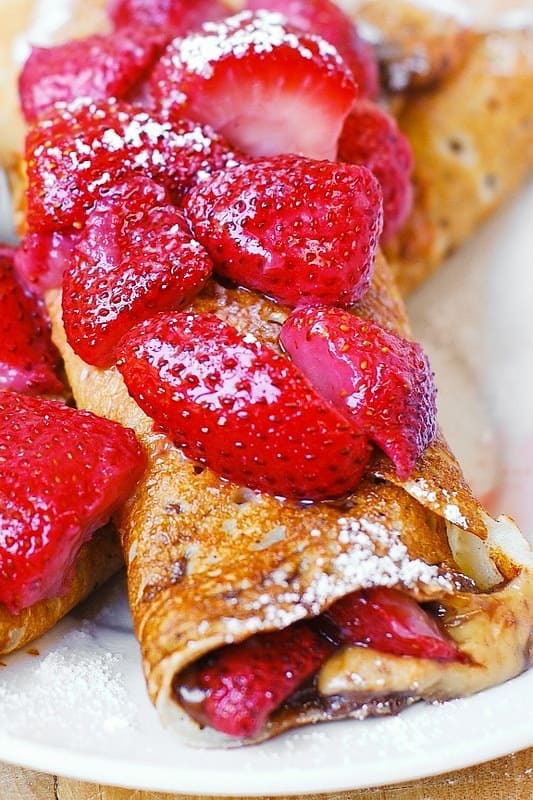 That already looks pretty before it’s rolled up – what a great idea for a crepe filling.